This tee-shirt is from NewLook 6470, and it is supposed to be a fail. If you look at the pattern drawing (view D), the fit looks nothing like this. This top is supposed to hug the body. I surmise the knit fabric I used wasn’t stable enough by a long run. This was a remnant from the bargain tables in front of Boeken’s (same old favourite from my Amsterdam days). When I tried on the top and saw how large (and indecent!) it was, I burst out laughing, and got ready to take it apart and start over with a smaller fit. Then I got to think that it might be cute to wear as an oversized top layered over a tank top. 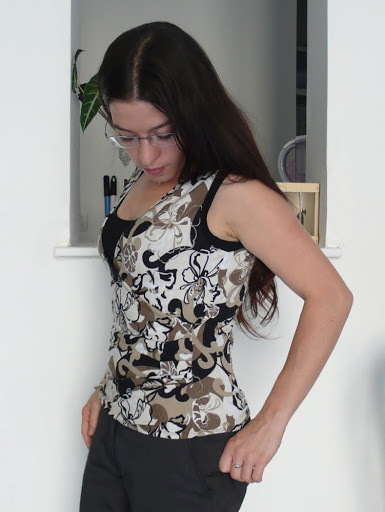 The only problem was the armholes – way too wide and lanky. I remedied that by binding them with a stable black knit. The single other alteration I did was to the front – I took the gathered side in at the top, to give the fabric a nicer drape. The initial version was really too droopy, even for a layered top. This was not what I had in mind at all, but it turns out I love this top, and I’ve been reaching for it time and again over the past two weeks when I want a casual look. I just feel – cute in it, even though I may look my age even less than usual. This was the third time I used this pattern (the first two versions, view A and A/B, are here and there), and as you’ll see shortly – I’ve used it twice more since! Using a pattern 5 times is a personal record – and to be honest, the envelope never even appealed to me (don’t you guys agree the model looks decidedly dowdy?). I really like the top layered. Great job on rethinking the top. It looks great. Love the look. You did an excellent job in saving this blouse! It looks wonderful. Often I have purchased blouses of a similar style and found that they too are rather “indecent” in the low “V” of the neckline. I suppose the younger women wear them that way!? 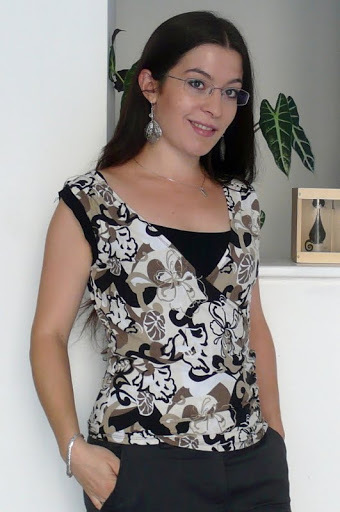 I have also done this method to wear a tank-top under the blouse. I also turn it to a Winter blouse by wearing a close-fitting long sleeve top under the blouse. Very cute! Isn't it mysterious how certain pieces become favorites? Great save. Glad you saved it. It does look very nice on. Great print. Great save. It is cute on you & nice print. C'est très beau et tu sais le combiner avec tellement de couleurs (blanc, noir, brun, beige). Et en dessous d'un tailleur cela peut très bien se porter à des occasions plus “formels” aussi je trouve. Bien trouvé avec le top en dessous. Amuses-toi bien. Ann. It's always great when a wadder can be saved! Nice work! What a save! I am learning that some patterns can quickly become favourites too. I'm glad you were able to save this one – it looks great. What a nice surprise to get your coverstitch machine, too! I had trouble with the fit of that top as well, but it looks so cute as a layer! Love the way you bound the armscyes. Another plus: if you are ever in need of a cute warm weather “indecent” piece of sleepwear, you know you have just the pattern for it! What a great save! Wonderful top. Funny how a pattern envelope that is so uninspiring can lead to such a flattering top… Creative minds can see past that, huh? Sometimes I find the flats on the envelope back more inspiring! Beautiful save! Congratulations on an even more wonderful result than originally intended. When we're willing to 'work it' it's sometimes so rewarding, n'est ce pas?